Though volumes have been written about Jesuit Missions in South America, very little is known about their long-term economic legacy. Using a novel dataset, this column argues that the 17th century Guarani Jesuit Missions had long-lasting positive effects on education and income. It also suggests cultural and occupational mechanisms that might be driving the persistent effects observed. The aftermath of European colonialism has been an active area of research in the social sciences. While Europeans often imposed extractive institutions and created exploitative economic relationships (Acemoglu et al. 2001), they also transferred human capital, cultural values, and technological know-how (Glaeser et al. 2004,Easterly and Levine 2016), which may have led to beneficial effects in the long run. In terms of mechanisms, Dell (2010) stresses the negative effect of the mitalabour system in Latin America, while Nunn and Wantchekon (2011) document the adverse impact of African slavery through decreased trust. Less is known, however, about the way in which other colonial arrangements (moral legitimacy aside) might have led to positive outcomes in the long run. Religion was – along with profit making and a desire for adventure – one of the main reasons for travelling to the New World. Religion also constitutes a fundamental aspect of culture. Cultural explanations of economic performance date back to Max Weber’s Protestant work ethic hypothesis (Weber 1905) and have been recently summarised by Alesina and Giuliano (2015). Modern economic research on religion has studied the impact of Protestantism in Europe (Becker and Woessmann 2009) as well as 19th century Christian missions in Africa (Nunn 2010, Wantchekon 2015, Cagé and Rueda 2016). Religious proselytising aside, missionaries brought with them a new set of skills, technologies, and values that could have been transferred to the local populations, a possibility I explore in this column. I demonstrate here the important long-term economic benefits of Catholic missionary activity in South America (based on Valencia Caicedo 2018). I focus on missions founded by the Society of Jesus (Jesuits) during the 17th century amongst the Guarani in modern-day Argentina, Brazil, and Paraguay. While religious conversion was the official aim of these Catholic missions, they also furthered human capital formation by schooling children and training adults in various crafts. The setup is unique in that Jesuits were expelled from the Americas in 1767 and never returned to the Guarani area, thus precluding any direct continuation effect. To disentangle the national institutional effects from the human capital shock Jesuit missions supplied, I use within-country variation in missionary activity in three different countries. Hence I employ municipal-level data for five states: Corrientes and Misiones in Argentina, Rio Grande do Sul in Brazil, and Itapua and Misiones in Paraguay. Figure 1 shows the location of the Guarani Jesuit Missions in Northern Argentina, southern Brazil, and Paraguay. The area under consideration was populated by a single semi-nomadic indigenous tribe, so I can abstract from the direct effect of different pre-colonial ethnicities (Maloney and Valencia 2012, Michalopoulos and Papaioannou 2013). The early stage of development of the indigenous inhabitants at the time of contact also makes the setting unique. The Guarani area has similar geographic and weather characteristics, though I still control for these variables in the empirical analysis. 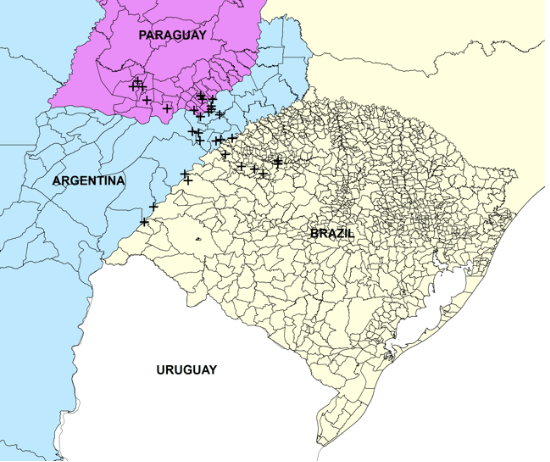 Note: The map shows the exact location of the Guarani Jesuit Missions, along with municipal level boundaries for the states of Corrientes and Misiones (Argentina), Itapua and Misiones (Paraguay) and Rio Grande do Sul (Brazil), and state boundaries for other states in Argentina, Brazil and Paraguay. I find substantial positive effects of Jesuit missions on modern-day human capital and income measures, 250 years after the missionaries were expelled. In municipalities where Jesuits carried out their apostolic efforts, median years of schooling and literacy levels remain 10-15% higher. An illustration of this main finding can be seen in Figure 2, which plots literacy rates in 2010 on distance to the nearest mission. These differences in educational attainment have also translated into modern per capita incomes (or lower poverty rates) that are nearly 10% higher. Figure 3 provides an illustration of this finding using nighttime satellite data. Municipalities with historical missionary presence appear lit at night (i.e. richer). In order to rationalise these enduring educational and income differences, I examine later occupational, cultural, and behavioural channels of transmission. Notes: The figure is an unconditional plot of 2000 literacy in percentages for people aged 15 and older in Argentina, Brazil and Paraguay versus distance of the municipality centroid in kilometers to the nearest Jesuit mission. Orange triangles represent missionary municipalities and blue dots non-missionary ones. The red line is a linear trend. The sample is restricted to a 225 kilometers distance threshold. 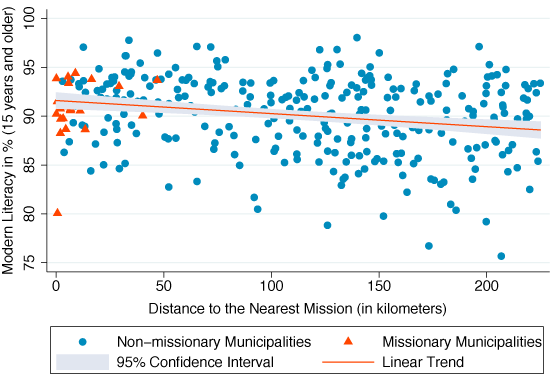 Note that distances for missionary districts are not necessarily zero, as they are measured from the municipality’s centroid. Notes: The map depicts the nighttime satellite images of the Guarani Jesuit missionary area along with municipal level boundaries for the states of Corrientes and Misiones (Argentina), Itapua and Misiones (Paraguay) and Rio Grande do Sul (Brazil). Red crosses denote the location of the Guarani Jesuit Missions. Even though I net out country effects and control for a large set of geographic and weather characteristics, Jesuit missionaries might have chosen favourable locations beyond such observable factors. Hence the positive effects encountered might be due to this initial choice and not to the missionary treatment per se. Toaddress then the potential endogeneity of missionary placement, I conduct two empirical tests. The first is a placebo test that looks at missions that were initially founded by the Jesuits but were abandoned early on (before 1659). I can thus compare places that were initially picked by missionaries with those that actually received the ‘full’ missionary treatment. I find no effect for such missions, which suggests that what mattered in the long run is what the missionaries did for centuries and not where they first settled. Because abandonment itself might have been a voluntary choice, I also conduct a comparison with the equally successful missions established by the Franciscan order. These neighbouring Guarani Franciscan Missions were founded slightly earlier (from 1580 to 1615). The comparison is relevant in that both orders were Catholic and employed European evangelists who wanted to convert souls to Christianity. Yet Jesuits emphasised education and technical training in their conversion relative to the Franciscan mendicant Order, which mainly tended for the poor and the sick (Waldinger 2017). Contrary to the Jesuit case, I find no positive long-term impact on either education or income for Franciscan Guarani Missions. This suggests that the long-term income differences I estimate are likely to be driven by the Jesuit’s emphasis on human capital. Using historical censuses, I am able to trace the human capital effect through the intervening period between the missionary era and today. I use data from the 1895 Census of Argentina, the 1920 Census of Brazil, and the 1950 Census of Paraguay. I find that Jesuit missions had an even larger effect on human capital during intermediate historical periods and that these effects are larger for females and concentrated on local inhabitants rather than foreigners, as expected. In terms of transmission mechanisms, I find that municipalities closer to historic missions have changed the sectoral composition of employment, moving away from agriculture and towards manufacturing and services (consistent with Botticini and Eckstein 2012). These sectoral changes also extend to occupational specialisation in more skill-intensive industries, following the categorisation of Ciccone and Papaioannou (2009). I also find that such areas differentially adopted new agricultural technologies, such as genetically modified soy varieties (as in Bustos et al. 2016). To better understand the mechanisms at play, I further examine cultural and behavioural outcomes that can sustain the transmission of human capital from the missionary period to the present (Valencia and Voth in progress). To do so, my co-author and I conducted a household survey and lab-in-the-field experiments in Southern Paraguay and Northern Argentina. We find that respondents in former missionary areas have higher non-cognitive skills and behave more pro-socially. As can be observed in Figure 4, we find that respondents in missionary areas possess superior non-cognitive abilities, as proxied by higher ‘locus of control’ scores (Heckman et al. 2006). Using standard games from the experimental and behavioural literatures, we find that respondents in missionary areas exhibit greater altruism and more positive reciprocity, are less risk seeking, and behave more honestly. We use priming techniques from experimental psychology to investigate whether these effects are the result of greater religiosity (Norenzayan 2013, McKay et al. 2014) – which appears not to be the case. 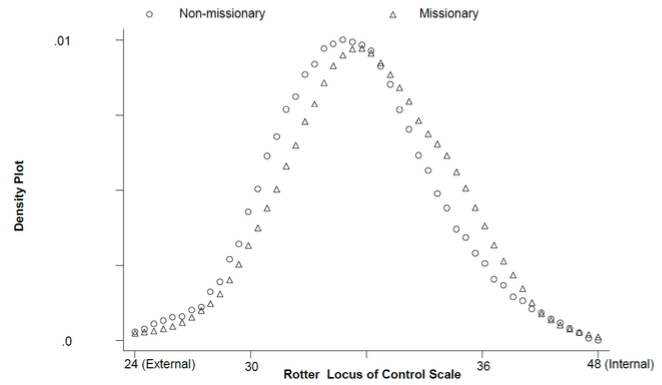 Note: The figure depicts a density plot of the Rotter Locus of Control Scale (going from low values of external control to high values of internal control), separating between non-missionary areas (in circles) and missionary areas (in triangles). The case of the Guarani Jesuit Missions serves as a microcosm to study important economic questions. I find not only an important degree of economic persistence, in line with the recent literature, but also specific transmission mechanisms through which this persistence is enacted. Using this unique setup, I demonstrate how a historical human capital intervention can lead to substantial differences in educational and economic outcomes in the long term. I further document specific cultural and occupational mechanisms that can sustain these differences such as intergenerational knowledge transmission and non-cognitive skills. The findings support the view that historical investments in human capital can have very long-lasting consequences, altering communal culture and individual behaviour. Far from advocating historical determinism, a thorough understanding of such deep determinants of development can help to make economic policies more targeted and effective. Editor’s note: A previous version of this column first appeared as a chapter in the Vox eBook, The Long Economic and Political Shadow of History, Volume 3, available to download here. Acemoglu, D, S Johnson and J A Robinson (2001), “The Colonial Origins of Comparative Development: An Empirical Investigation”, American Economic Review 91(5): 1369-1401. Alesina, A and P Giuliano (2015), “Culture and Institutions”, Journal of Economic Literature 53(4): 898-944. Becker, S O and L Woessmann (2009), “Was Weber Wrong? A Human Capital Theory of Protestant Economic History”, Quarterly Journal of Economics 124(22): 531-596. Botticini, M and Z Eckstein (2012), The Chosen Few: How Education Shaped Jewish History, Princeton, NJ: Princeton University Press. Bustos, P, B Caprettini and J Ponticelli. (2016). “Agricultural Productivity and Structural Transformation: Evidence from Brazil”, American Economic Review 106(6): 1320-65. Cagé, J and V Rueda (2016),”The Long-Term Effects of the Printing Press in Sub-Saharan Africa”, American Economic Journal: Applied Economics 8(3): 69-99. Ciccone, A and E Papaioannou (2009), “Human capital, the structure of production, and growth”, The Review of Economics and Statistics 91(1): 66-82. Dell, M. (2010), “The Persistent Effects of Peru’s Mining Mita”, Econometrica 78(6): 1863–1903. Easterly, W and R Levine (2016), “The European origins of economic development”, Journal of Economic Growth 21(3): 1-33. Glaeser, E L, R La Porta, F Lopez-de-Silanes and A Shleifer (2004), “Do institutions cause growth?” Journal of Economic Growth 9(3): 271-303. Heckman, J J, J Stixrud and S Urzua (2006), “The Effects of Cognitive and Noncognitive Abilities on Labour Market Outcomes and Social Behavior”, Journal of Labor Economics 24(3): 411-482. Maloney, W F and F Valencia Caicedo (2016), “The Persistence of (Subnational) Fortune”, Economic Journal. Michalopoulos, S and E Papaioannou (2013), “Pre-Colonial Ethnic Institutions and Contemporary African Development”, Econometrica 81(1): 113-152. Norenzayan, A (2014). Big Gods. Princeton, NJ: Princeton University Press. Nunn, N (2010), “Religious Conversion in Colonial Africa”, American Economic Review, Papers & Proceedings 100(2): 147-52. Nunn, N and L Wantchekon (2011), “The Slave Trade and the Origins of Mistrust in Africa”, American Economic Review 101(7): 3221-52. Valencia Caicedo, F (2018) “The Mission: Human Capital Transmission, Economic Persistence and Culture in South America”, The Quarterly Journal of Economics, forthcoming. Valencia Caicedo, F and H-J Voth (forthcoming), “Christ’s Shadow: Non-cognitive Skills and Prosocial Behavior Amongst the Guarani”, Bonn University. Wantchekon, L, N Natalija and M Klašnja (2015), “Education and Human Capital Externalities: Evidence from Colonial Benin”, Quarterly Journal of Economics 130(2): 703-757. Waldinger, M (2017), “The long-run effects of missionary orders in Mexico”, Journal of Development Economics 127: 355-378. Weber, M (1978), Economy and Society. Berkeley: University of California Press. Weber, M (2011), The Protestant Ethic and the Spirit of Capitalism. Oxford: Oxford University Press.